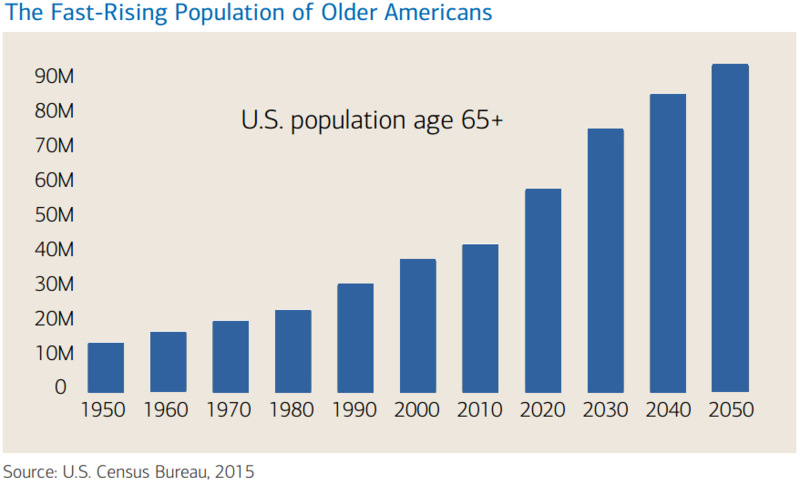 The National Center for Health Statistics (NCHS) recently estimated that the average life expectancy for Americans is 78.8 years, and the U.S. Census Bureau projects that this could continue to rise by nearly two years per decade going forward. However, that popular statistic only refers to life expectancy at birth, whereas life expectancy after you reach a certain age can be much higher. If you are age 65, for instance, then there is a 47 percent chance you or your spouse will live to at least 90, according to J.P. Morgan calculations using Social Security Administration data. 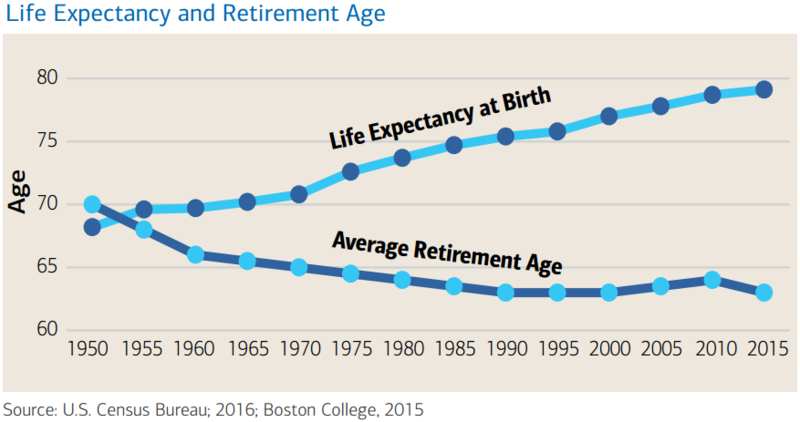 More importantly, the average retirement age in this country has changed very little over the past half a century, meaning that thanks to rising life expectancies many Americans are likely going to have to finance longer and longer retirements. That is not an impossible feat, especially for people who start setting money aside for retirement early on in their working career and utilize every tax-advantaged savings vehicle at their disposal. A new report from Bank of America Merrill Lynch (BofAML), though, argues that too many U.S. adults are still not doing enough to ensure a comfortable and secure retirement. Indeed, the report’s authors point out that around a third of Americans have no retirement savings whatsoever, including 42 percent of Millennials who have yet to begin setting any money aside. 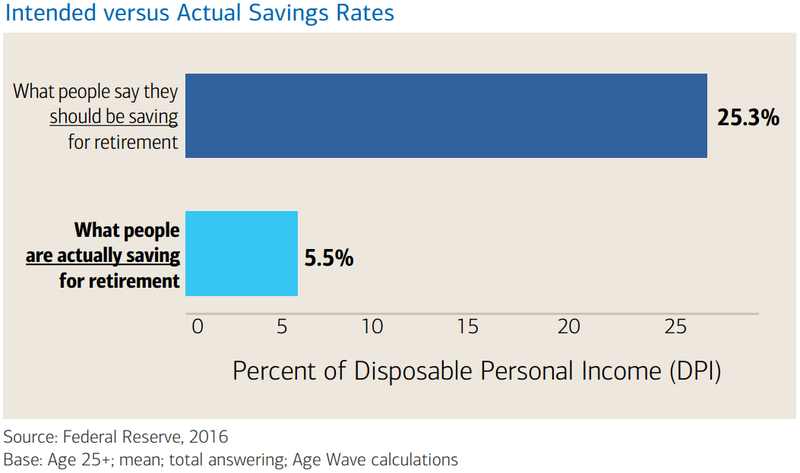 Further, surveyed Americans on average said that they believe they should be saving around a quarter of their disposable (after tax) income each year for retirement. That sounds great but the average annual savings rate in this country is below 6 percent, suggesting that most people struggle to regularly set aside as much as they would like to. 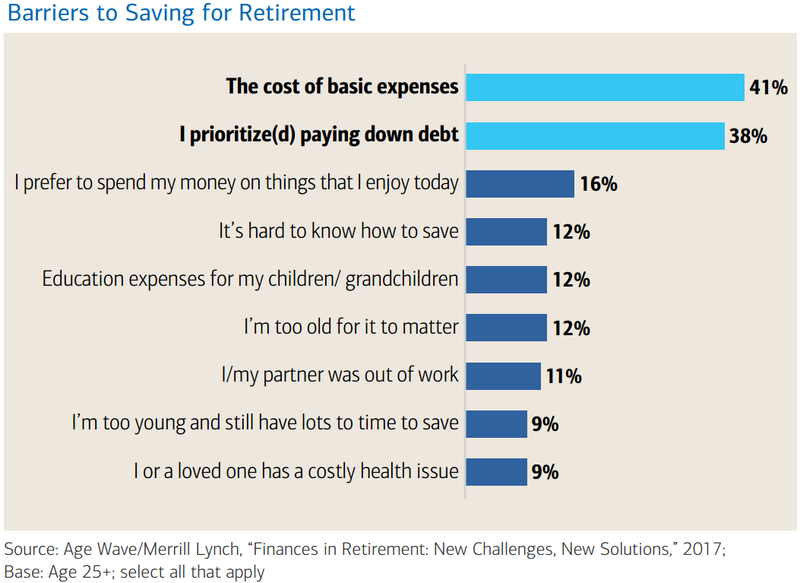 When asked about barriers to saving for retirement, “the cost of basic expenses,” and “I prioritize(d) paying down debt” were most frequently cited by respondents. 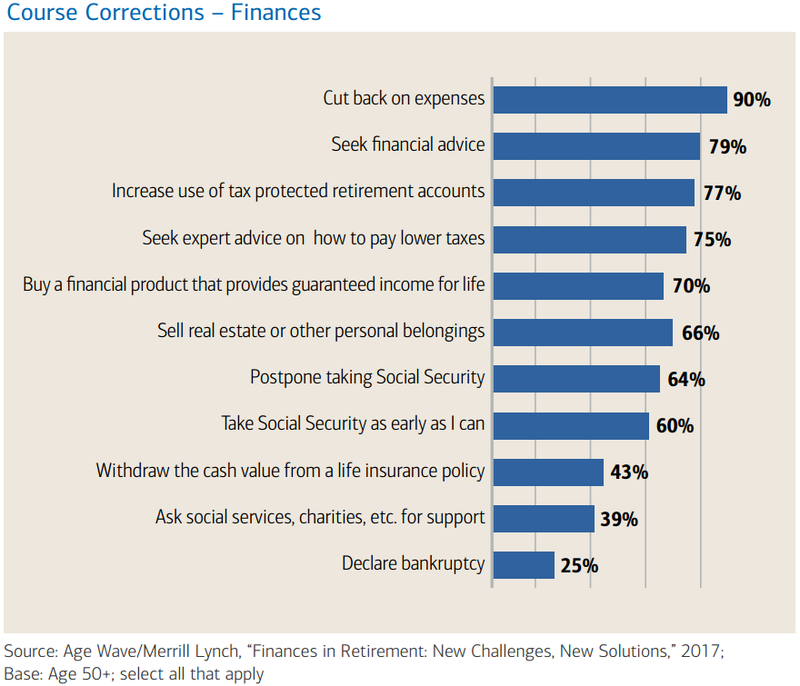 As for ways to potentially improve their personal finances, the number one response from surveyed Americans behind cutting back on expenses was seeking professional financial advice. That is encouraging because although most respondents appear to recognize the importance of saving for retirement, 81 percent said that they have no idea how much money they will actually need to set aside. 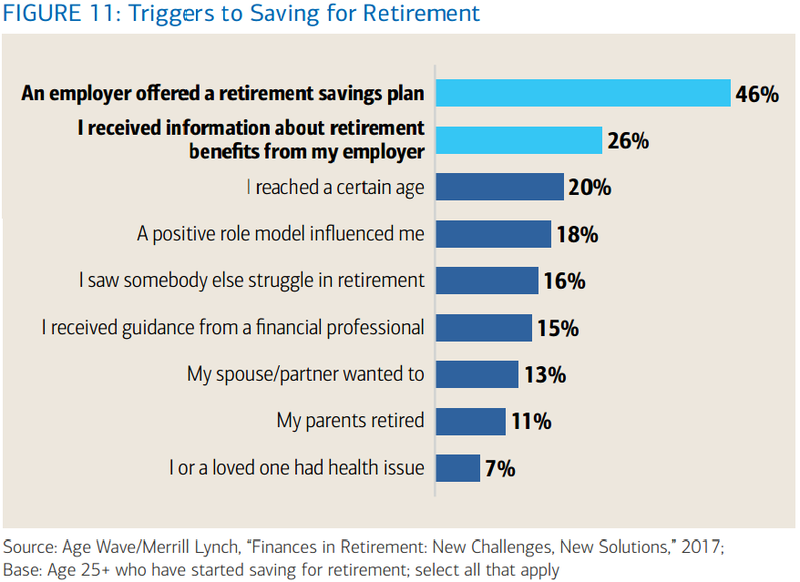 Employers also seem to play a big role in Americans’ overall level of retirement readiness because when respondents were asked why they first started saving for retirement, the top answers were “an employer offered a retirement savings plan,” and “I received information about retirement benefits from my employer.” This shows that companies offering workers access to a 401(k) or similar benefit will not only be more competitive in the talent search but also help employees better prepare for their financial future.